Nope, I’m not talking about deadheading spearmint flowers. I was picking some leaves for no other reason than to crush them between my thumb and index finger and hold them to my nose. If you were passing by you might have thought I was picking my nose but I assure you I was only enjoying the spearmint fragrance. 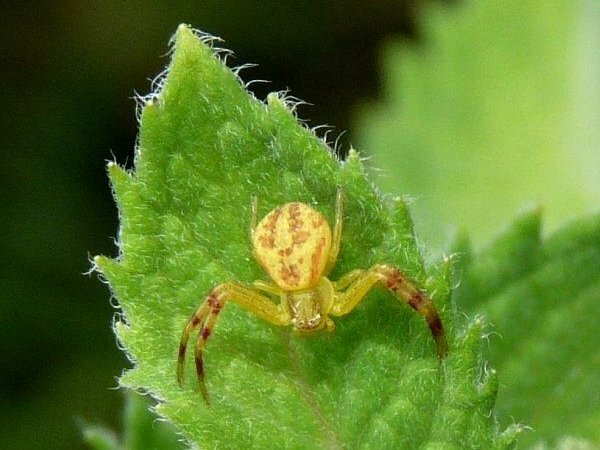 Of course I had my camera with me so when I spotted the crab spider on a leaf I took yet another photo. I didn’t expect to use it but it turned out to have an unusual marking on its abdomen. I think it looks like a skeleton face. The spearmint is a major hassle in the garden. It is way too aggressive and a pain to keep under control. It can sneak underground 3 feet in a season in rich, moist and loose garden soil. On the plus side, mints of all sorts are welcome to encroach into the ‘lawn’. I love the aroma as I mow it down to size. Holy Moley! I Googled dried spearmint leaves for sale and the cheapest I found went for $8 a pound. Too bad it’s too late for harvesting quality leaves. The spearmint is in full bloom and it should be cut before blooming. Now I’m thinking of roto-tilling the garden next year and letting the spearmint and peppermint have their way. Great minds or what? Nice to see you again. Don’t quit your day job. There is a lot of spearmint in a pound of dried leaves. I dry some for tea every year but no where near a pound. I never realized the leaves were so hairy. That is a great spider But I don’t see a skull I see Larry from The Three Stooges. I guess beauty is in the eye of the beholder. It looks like a Mexican wrestlers mask, but creepier… if that’s possible.